Hooray - first finish of the year! I hoped briefly that it might be the last finish of 2018 but that idea didn't last long. I'm very happy it's done now though. I especially like the colours in this: the black print and those gold and purple triangles against all the sort of pastel colours, which rather smoosh into each other. It's really hard to get a good photo of the pale shades, even in daylight, and this is the best I can manage. If you want to check out the photo of the bundle of shirts I kicked off with, which gives you a much better idea, you can find it here. The back is pieced, but unremarkable; the quilting is another go at cross-hatching, though this time I've used single lines, rather than double, and tried to be slightly more regular. The binding is this brown and white stripe. I started this on July 7th 2017 - and finished piecing on October 9th. Started quilting on 1st of December 2017 and finished on 13th January this year. That is pretty fast for me. The wadding is my standard fallback 70/30, totally recycled option. It's quilted with perle cotton, in several neutral shades plus a bit of a yellow-y one. Basically I just went through my box and pulled out whatever took my fancy. I can't think of a better way to kick of my quilting year. It is a fantastic way to kick off your quilting year! The crosshatch quilting compliments it so nicely and adds a great texture. It's beautiful, Kaja. LOVE your beautiful quilt! It's frustrating when we can't get a really good pictures of these sorts of quilts. I'm sure there is a wonderful radiance to this quilt in the right lighting! The colors are so sweet and there's just enough of a pattern to keep it very interesting! Your crosshatch stitching is perfect for it. I haven't done that with hand quilting for a long time. Will have to revisit that one of these days as I love the simple charm to it! Big congrats on your finish! I like that you used different colors of thread. I used four colors on my latest quilt (no pictures yet because I don't have anyone to hold it up) and loved the look as well as the interest it gave ME because I was changing colors. Very nice! Your backgrounds "smoosh" together beautifully. An online store friend of mine said brights sell so much better than soft pastels because they show up on the screen. And yet, we like to live with these softer colors. You just want to snuggle. How do you keep your quilting lines so straight? Tape? Mine perennially wander. There's something so lovely about this quilt, is it the vintage vibe? or the soft faded colours? or the delightful improv piecing of those hourglasses ... all of the above I suspect! I just love the overall pastel lavender look with the 'pops' of black & gold, and all your hand quilting makes it so special. Congratulations on your first finish! It turned out lovely! I really like the binding; a bit unexpected and so fun. It's gorgeous! I love the watercoloury effect you created! Congrats on the first finish of the year! 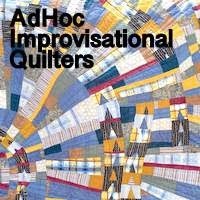 I have liked this quilt from the very beginning but now? I LOVE IT. And the way you described how you chose your quilting threads is marvelous. I agree - what a fantastic way to start 2019.
hey right on! grwat finish to this sweet quilt. Love, love, love this quilt!!! Congrats on the finish! Perfectly smooshed and looks very inviting and comforting. Congrats! I am absolutely, totally in LOVE with this quilt!! Congratulations on your finish. The colours are lovely, especially the purple and I love those olive green triangles. Who'd have thought some old shirts could be transformed into something so beautiful? You, of course! I am very pleased that I can read your blog. Posts are very helpful! Thanks for sharing your projects with us, I appreciate it! The colors on the quilt look great! Oh..my ..you have a winner here...great job. What a first finish for 2019! I also love the colours in this particular quilt, they give a lovely softness. So beautiful, Kaja! I love the soft colours in this one, the purple and the gold triangles made me think of confetti, no idea why. Your hand quilting is so pretty. The border looks like blanket stitch, one of my favourites. I love this one.